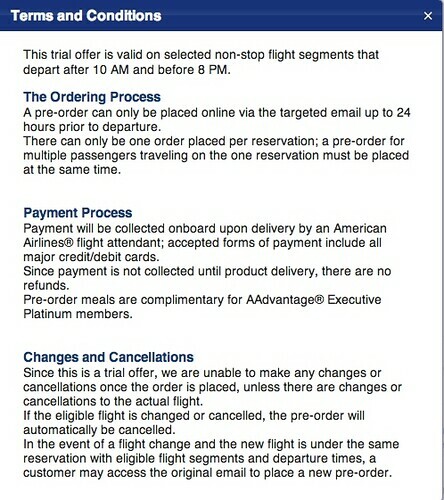 A few weeks ago, American began offering First and Business Class passengers the option to pre-order their choice of entree on several domestic routes. I’ve had the opportunity to try it and got exactly what I ordered. American deserves lots of praise: it’s a big enhancement and a huge improvement over FEBO! Passengers in the Main Cabin may soon be able to so something similar. 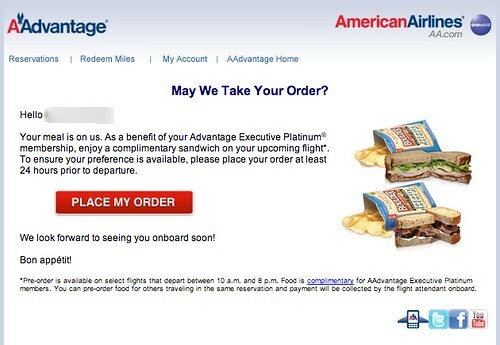 American is now offering some customers the chance to pre-order Buy on Board food items on some select non-stop domestic flights that depart between 10 AM and 8 PM.. 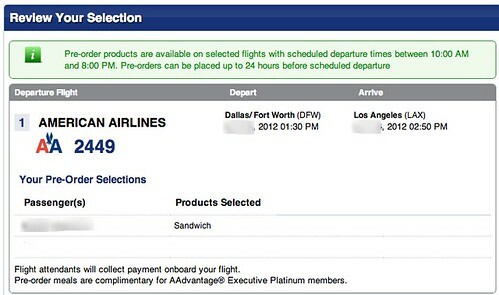 The other day I receive an email inviting me to place an order for a sandwich a few days before an upcoming flight. Here’s the ‘Place My Order’ page. Here’s the confirmation. I chose the turkey sandwich, but it just displays at ‘Sandwich’. And the terms and conditions. A frustration of traveling at the back of the plane can be those occasions when there’s not enough food for everyone, or because of where you’re sitting, you get stuck with the unappetizing choice that nobody else wants. 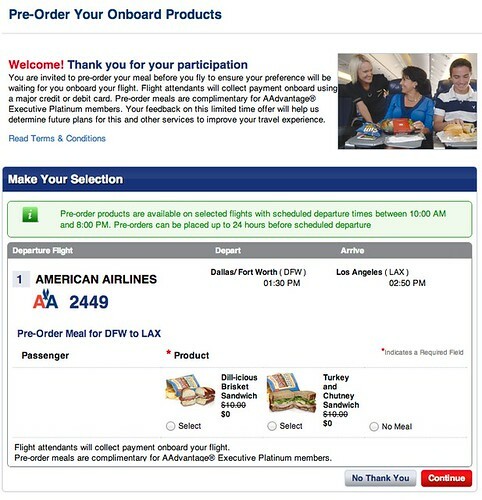 Being able to pre-order your choice of food item will be a big improvement, particularly when you’re traveling on a long flight or making a tight connection and don’t have time to grab something to eat between flights. Hopefully they’ll be able to expand the trial and make this a standard option! Northwest Airlines used to offer this in the main cabin as well. Each time I flew with them from MSP to Hawaii I ordered their sandwich, and folks around me were envious when they had run out by the time they go to my row. Kudos to AA! @ JohnSD – I didn’t know that, but I’m not surprised. Even though I didn’t get to fly with them very often, I was always a big fan of Northwest Airlines and thought they were always very customer focused. Thanks for the comment!